Did you know that when you’re feeling aches and pains, it is your body’s way of signaling that it is not working properly? Your brain, spinal cord and nerves control how your body works, so when your body is stressed physically, chemically or emotionally, it will produce a defensive posture. The services at Family Wellness Centre are designed to help remove these different stresses from your life, allowing your body to live up to its full healing potential. We utilize a variety of techniques to meet each patients’ unique needs. Chiropractic adjustments are used to restore proper spinal motion, alignment and nervous system function. At Family Wellness Centre, we pride ourselves on using the most precise and gentle techniques to help restore your health. 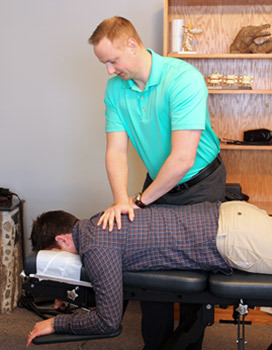 Instrument-assisted techniques can be used for people with sensitive tissues and are a gentle, low-force approach to chiropractic care. These safe techniques have helped patients of all ages since the late 1960s, bringing relief to people with a variety of health concerns. Specially designed tables will help Dr. Jon to give you a comfortable adjustment. Children, the elderly or challenging cases such as patients who have had spinal surgery and those with spinal stenosis can still receive effective safe adjustments. Dr. Jon welcomes the opportunity to speak at your organization, business or club to discuss what we do here at Family Wellness Centre and how to live a healthier life. Orthotics are insoles that are made specifically for you. Each person is unique, and so are the requirements needed to balance your body from the feet up. We use orthotics on a case-by-case basis to help the body improve function and stability. A digital scan is performed to determine what your particular needs are, and the orthotics are made just for you. Problems that may benefit from the use of orthotics range from osteoarthritis to loss of function and pain. These inserts are designed to keep you on your feet and moving in the right direction. If you have been in an accident, Dr. Jon can assess your condition and determine how to help you return to your healthiest state. We are a licensed Motor Vehicle Accident clinic and can take care of people who have experienced whiplash. If you have extended health benefits, we will provide you with a receipt so that you can apply to be reimbursed. Revitalize your health and life, naturally. Contact us today to schedule your first appointment!